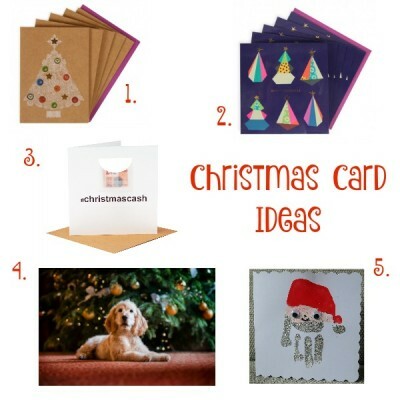 After all the excitement of buying the Christmas presents, we must not forget Christmas cards! There are so many lovely ones out there from Charity ones, homemade ones and beautiful ones. Here are a few I have picked out. Paperchase Christmas cards made from neutral brown kraft card, each featuring a lace design Christmas tree with button baubles and gold foil stars. Paperchase 8 charity Christmas cards featuring a graphic tree design with gold foil finishes. Cool hashtag Christmas card*, you can add your own hashtag wording to the front of the card to make it a great personalised Christmas card. The card has a pretty miniature glassine envelope 2″ x 2″ and comes with a paper £10 note slip (not a real £10 of course), ready for you to fill in with your folded cash note. Hearing Dogs for Deaf People Charity Christmas cards, featuring beautiful dogs from the Hearing Dog family. Homemade designs that you can make with your kids, I featured 4 great designs to try. *Items marked with * are items we have been sent in return for featuring in this guide.